T-Mobile is at it again this afternoon, releasing a press release just hours after an earnings call from AT&T, celebrating the carrier for leaving “the Dark Side.” What makes the release even funnier is that T-Mo had the cojones to use fake quotes for AT&T’s own Ralph de la Vega, implying that he has somehow seen the light and decided to put the customer first for a change. Here is an excerpt from the release with the fake quote from de la Vega that T-Mobile used so humorously. After the quote, the press release continues on with, “Ok, De La Vega didn’t actually say that, but he might as well have.” and thankfully, at the very end of the release it clearly states, “The preceding mock press release was written with tongue firmly planted in cheek.” T-Mobile’s CEO, John Legere loves these types of campaigns, because it gets the public talking. He is a firm believer in the any press is good press attitude. Following the fake quote, the press release uses a real quote from T-Mo’s CEO, acting as if he can’t believe that AT&T is doing the right thing, actually helping its customers. It’s kind of like that scene where Darth Vader’s lying there and Luke helps take off his helmet and you see that, okay, sure, Darth Vader’s pretty ugly, but he’s human after all. You have to give props to Legere for referencing so much Star Wars in a single press release. And for those that say this may be too far, T-Mobile has every right to go to such lengths. 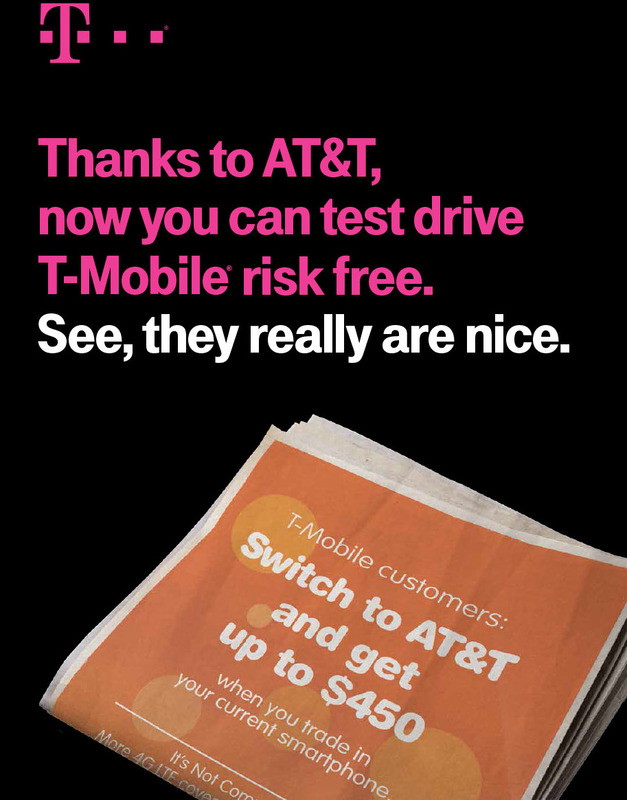 With AT&T paying up $450 to T-Mo customers for making a switch, they are essentially allowing current AT&T customers a chance to try out the UnCarrier network risk free. Thanks to AT&T’s apparent change-of-heart and incredibly generous $450 T-Mobile customer buy-back campaign, insane numbers of its very own customers and even families of AT&T employees are enjoying a risk-free, zero-cost opportunity to switch to the Un-carrier. If customers making the switch are not satisfied with T-Mobile and its state-of-the-art nationwide 4G LTE network (now fastest in the U.S.), AT&T will cover the costs for customers switching back to their own slower network, up to $450 with trade-in. You can rest assured that T-Mobile and AT&T are nowhere near done with these types of jabs, so 2014 is looking like a good year for the consumers.